The ability to split an iPad's keyboard is one of many hidden tricks that most people don't know about. If you are really good at thumb-typing on your phone, this mode might speed up your typing even when you aren't holding the iPad on its side. 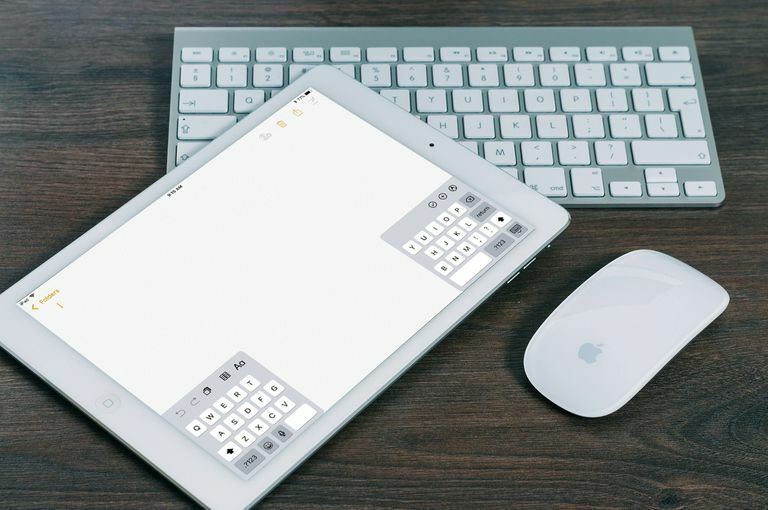 You can split the iPad keyboard in two different ways. The first method uses the keyboard; the second uses your fingers and the screen. The Keyboard key in the lower right corner of the on-screen keyboard normally makes the keyboard disappear. But if you hold your finger down on it, a menu pops up). This menu will let you undock the keyboard, which puts it in the middle of the screen, or simply split the keyboard in two. There's a quicker way of splitting the keyboard. You can actually pull it apart with your fingers. Do this by placing your fingers or thumbs in the middle of the keyboard and then moving them to either side of the screen to virtually pull the keyboard apart. Note: The addition of the Virtual Touchpad to the keyboard in iOS 9 makes this a little trickier. If you engage the virtual touchpad, the iPad won't recognize the gesture to split the keyboard. It's worth the update to the current iOS if you use this feature a lot. If you are having trouble pulling the keyboard apart, you can try placing the iPad flat on the table and using the zoom out gesture on the keyboard. This is accomplished by placing your fingers together and then moving them apart. If you do this with your hand positioned so that your fingers will move horizontally across the keyboard when you make the gesture, it will engage the split keyboard mode. And because you are doing it with one hand, it can be easier for the iPad to recognize. Apple is known for the little things which put the finishing touch on a product or feature, and it's no different with the split keyboard. There are actually hidden keys you can use when you have the keyboard in split mode. The first row of keys on the right keyboard half can be accessed on the left keyboard by typing in the place the keys would have been if the keyboard continued without the split. So you can type a Y by tapping your finger just to the right of the T and you can type an H by tapping just to the right of the G. This works on the other side as well, allowing you to type a T by tapping to the left of the Y. So if you are accustomed to reaching these keys with a bigger stretch while thumb typing, you should still be able to do so on the split keyboard. Once you are done with the split keyboard, you can "unsplit" the keyboard the same way you split it up. Hold down the keyboard key to pop up the menu. Select Dock and Merge to combine the keyboard and move it to the bottom of the screen. Alternatively, select Merge to combine the keyboard but keep it in the middle of the screen. Push the keyboard together with your fingers on the screen. This actually works a bit smoother than pulling them apart. Simply place your index fingers down at the middle edges of each keyboard half and move your fingers together.